Brewing craft beer is an art form. Beer collaborations are tangible proof of successful teamwork between two brewers working together for a single cause. The beat of a bass guitar, rap of a snare drum, and layered vocals of a lead singer leads to tangible, often visceral, proof that a band is truly in tune with each other. So when you put the creative beer and music geniuses into one room to collaborate on a beer, the results can be exciting. The level of enthusiasm around brewery and band collaboration beers is shared by the band, their following, and the brewers alike. 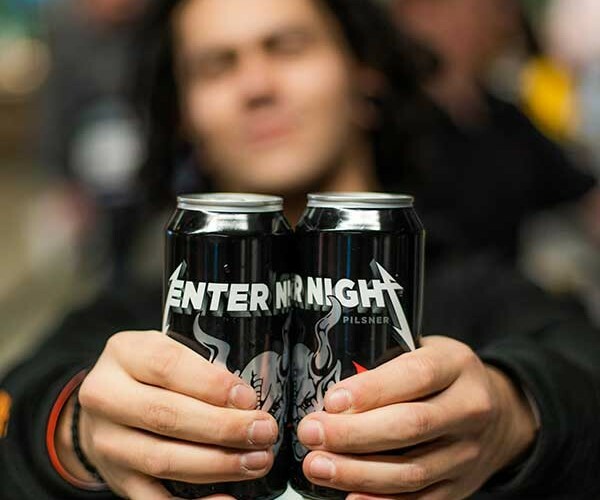 It’s an experience that lets fans engage and interact with their favorite brewers and bands in new ways, and even attract new people to the craft brewery scene. Beer collaborations come in all shapes and sizes. Some are driven by beer lover demand, others by a passionate brewer, and a few just fall into place. That was the case with California’s Stone Brewing and their recent collaboration with the iconic rock band Metallica. According to Stone Brewing‘s Executive Director and Co-Founder, Greg Koch, Metallica had been interested in making a beer for a while, they just didn’t know who they wanted to make it with. Eventually, the band settled on a brewery with a similar type of outspoken personality: Stone. It’s not every day that a Rock and Roll Hall of Fame band like Metallica and a musician like Lars Ulrich reach out to do a collaboration. Koch admits that he was skeptical at first. 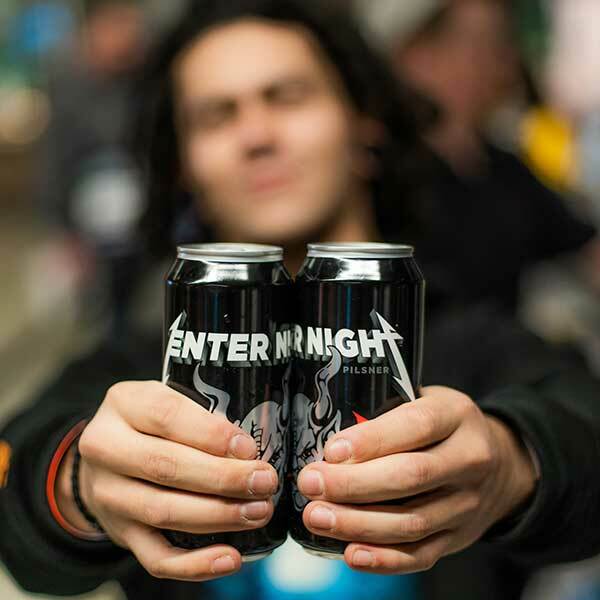 The result is the high-intensity, yet easy-to-drink Enter Night pilsner, invoking the name of one of Metallica’s most famous songs: “Enter Sandman.” Emblazoned with Stone’s demon insignia, Metallica signage, and a matte black can, the collaboration beer is a fitting creation for two artists who push the boundaries of their respective industries. Creature Comforts Beer Co. in Athens, Georgia, knows a lot about pushing boundaries. When the brewery opened in the college town 90-minutes outside of Atlanta in 2014, it quickly made a name of itself with its sought-after Tropicalia IPA. Georgia has a prominent musical history, thanks in part to the hip-hop hotbed of Atlanta. Creature Comforts rising popularity coincided with the growing hype around Atlanta-native Killer Mike and his entertaining and engaging hip-hop duo, Run the Jewels. The two parties were brought together through a mutual friendship and love of hip-hop, leading to the creation of Stay G-O-L-D IPA, named after a song in Run the Jewels’ “Run the Jewels 3” album. First released in 2017, the eye-catching IPA weaves together big doses of Strata, Citra, Mosaic, and Chinook hops in perfect harmony. 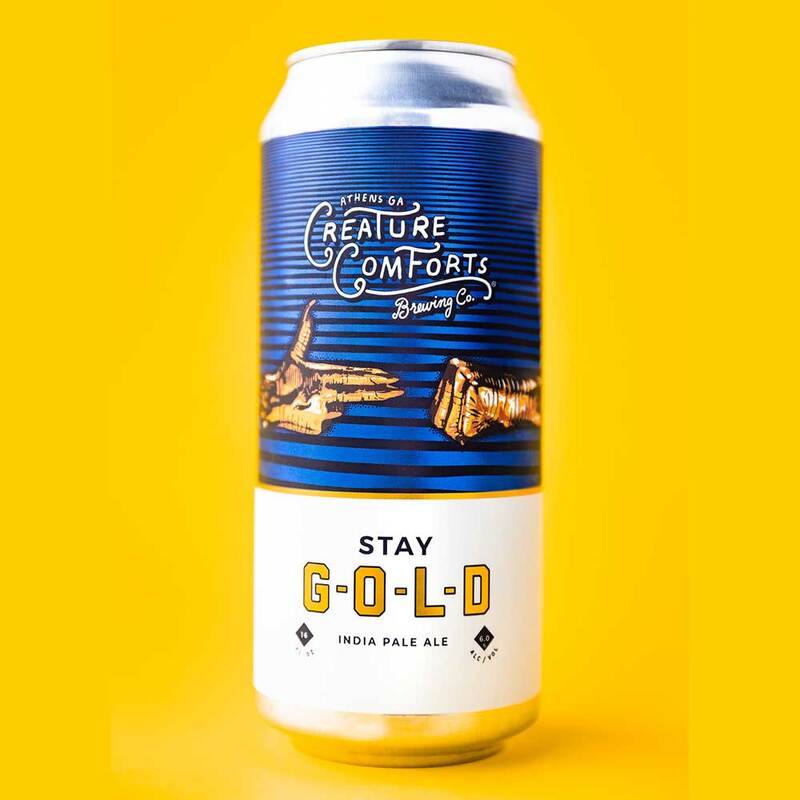 According to Creature Comforts Co-founder and Head Brewer David Stein, the duo of Killer Mike and El-P gave the brewers a lot of freedom in the brewing process and label design, but the musicians did have some specifications around the flavor. “They mentioned being interested in an IPA with a dank [cannabis-like] and juicy flavor and aroma, so we selected a hop profile based on our knowledge of styles and characteristics of different hops,” Stein says. The release became so popular that Creature Comforts and Run the Jewels released a second batch earlier this year. Much like making music, brewing a beer takes a hands-on approach. Music can also be a key component to a brewer’s identity, just ask the founder of Louisville’s “music brewery,” Gravely Brewing Company. Nathaniel Gravely worked in the music industry for over a decade and has always had a passion for music. His other passion was beer. Combining the two made perfect sense. “Each beer on our tap list is named after a song, lyric, or musical motif that we’ve found empowering in our own musical evolution or have impacted others,” says Gravely. Along with being a brewery, Gravely Brewing also hosts concerts, offering Nathaniel and crew a perfect opportunity to collaborate with some of their favorite musicians. The result is their recurring Musician Made Series, where Gravely collaborates directly with a band on a beer that will pour exclusively during their set at the brewery. It’s an interesting premise that gives new meaning to the beer and showcases a musician’s passion in a different artistic interpretation. It’s not surprising that the musicians that collaborate on a brew are passionate about the end product. Many musicians actually come up with the exact beer they want to make. 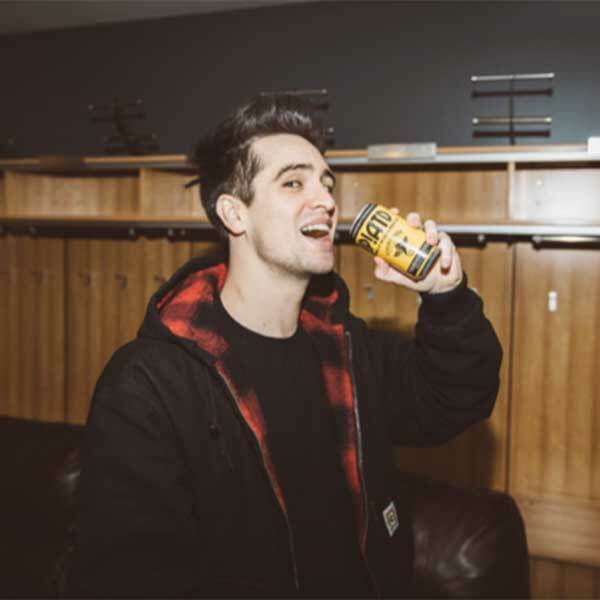 That was the inspiration behind Asbury Park Brewery‘s collaboration with Panic! at the Disco and frontman Brendon Urie. 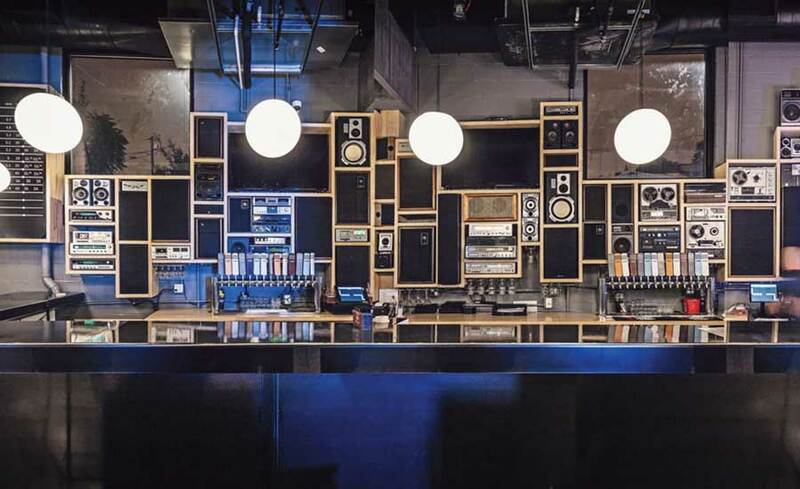 After Urie and the rest of the band played a private set at New Jersey’s legendary Stone Pony club, the band stopped at the nearby Asbury Park Brewery taproom and the idea of a collaboration with founder Jeff Plate and his brewery was born. The result was the aptly named “IP!ATD West Coast IPA,” a favorite style of Urie’s (even though Asbury Park resides on the East Coast). “Brendon Urie’s willingness to collaborate with us made it a very easy decision! He is a big fan of West Coast IPAs with piney hop characteristics and cranked up IBUs. Being on the East Coast, we tend to roll off the bitterness and go for juicier beers,” says Plate. Metallica took a similar hands-on approach when they brewed with Stone. Instead of an intensely-hopped IPA, the band wanted something easy to drink at concerts, tailgates, or just hanging out in a backyard. To ensure that the beer in their minds came to fruition, the band was fully invested in the brewing process, which Koch notes led to some interesting conversations and even opportunities for the brewery to educate the band about beer. Brewing a musician-inspired beer provides craft brewers the opportunity to reach new audiences. Minnesota’s Surly Brewing brewed a beer with the people behind the iconic music club First Avenue, the venue where several scenes of Prince’s 1984 movie “Purple Rain” were recorded. It’s also the biggest venue account across Surly’s distribution footprint. 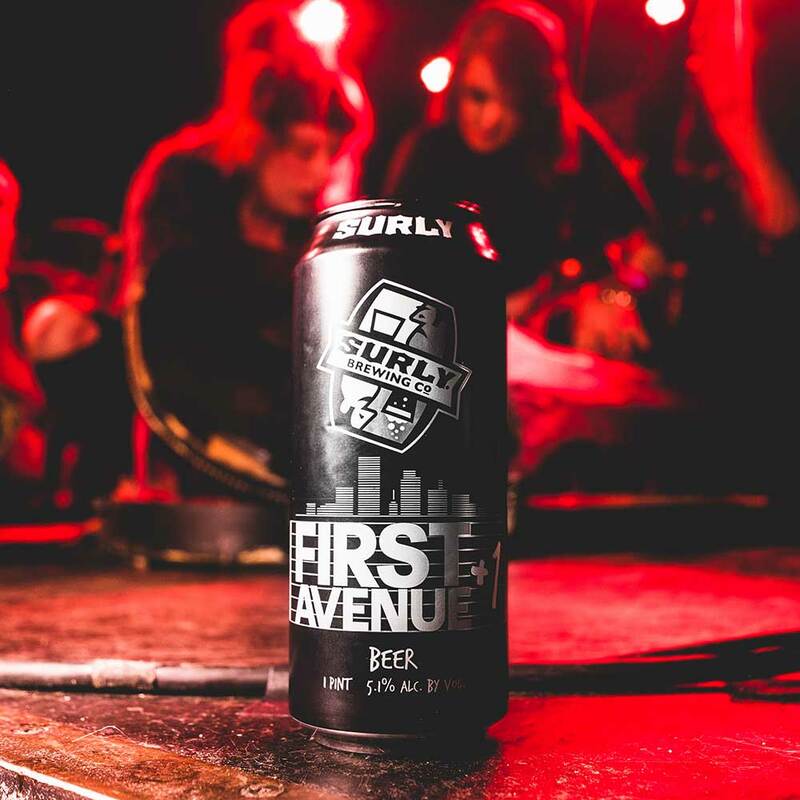 Regional Sales Manager Cory Just reached out to the folks behind First Avenue, leading to the creation of “+1 Golden Ale.” Working with a concert venue gave Just and the rest of the Surly team some audience insights into the exact type of beers and beer styles First Ave sold most often. These learnings pushed the Surly team to create something wholly unique for First Ave while still maintaining the boisterous Surly ethos. When working with a brewery, they typically have a portfolio of beers and we determine where both of our styles come together. For First Avenue, they don’t have a brewing portfolio, but they do know the styles of beers their patrons are drawn to at shows. We really needed to dial in the style based on what we all know to be true about what folks like to drink at a show. While it may have limited us both from making some out-there new-to-craft style, it did push us to create that perfect show beer, and that was inspiring,” says Just. Brewing a beer that music fans will enjoy while also being true to a musician’s unique brand is a difficult balance. When done correctly, you not only get accolades from the band, but also from the fans. Excitement around a brewery-band collaboration goes beyond boosting beer sales to possibly driving merchandise and social media impressions as well. Jeff Plate of Asbury Park Brewery notes that the announcement of their collaboration with Panic! At the Disco set their Twitter account on fire. It also led to an impressive turnout on release day. “We had a line down the block the day of the can release and completely sold out in about 3 hours,” says Plate. Stone Brewing says working with Metallica, a band that’s had a rabid fanbase for nearly four decades, drove a ton of positive interest in the beer collaboration, even from people who wouldn’t normally buy craft beer. “The Metallica fans have been awesome,” says Stone’s Greg Koch. Sometimes, even the best-known craft brewers are even bigger music fans. This is the case for Dogfish Head, who has made a habit of doing big collaboration beers with the likes of the Grateful Dead and the Flaming Lips. The primary driver behind Dogfish Head’s collaborations is Sam Calagione, the brewery’s founder and frontman. Here’s hoping brewers and bands alike look to each other for more collaboration opportunities in the future. Who knows, maybe the next iteration is a brewer-inspired ballad. Given how fast today’s craft beer industry moves, I wouldn’t be surprised. Cheers! The post Music to Your Beers: When Breweries and Bands Collaborate appeared first on CraftBeer.com.